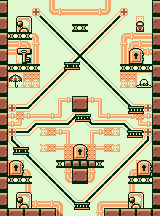 Stage 6-3 is the third level in the Airplane in the Game Boy version of Donkey Kong. This level features moving platforms and Fake Doors. Mario starts on a platform with the real door. He must ride either of the two moving platforms on the bottom to the moving platforms on the top, then Handstand Jump to the platform above the moving platforms. Afterwards, Mario must jump onto the moving platforms going across the "X" and jump over to the platform with the Key to grab it. Mario must then make his way down to the door without dropping the key or taking fall damage. Once he makes it to the door with the key the level ends. Hat: In midair below the platform with a Fake Door. Parasol: In midair below the platform the Key. Bag: Above the Fake Door which is above the Hat. This page was last edited on September 7, 2018, at 02:35.